One problem with new network devices is that they often come with a factory settings IP address that is not on your network. In order to communicate with that device - at least until you give it an IP address that is on your network - you need to reconfigure a machine so that it has a compatible network address. 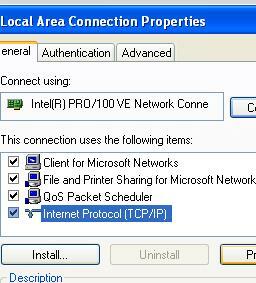 In Windows XP, right-click on the 'My Network Places' icon and select 'Properties' from the menu. This should open up the Network connections window. 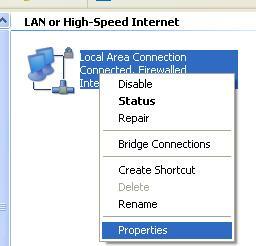 Right-click on the network interface icon and select 'Properties' from the menu. 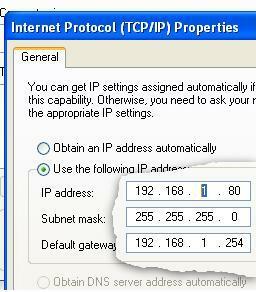 In the 'General' tab, select the 'Internet Protocol (TCP/IP) line and click on the 'Properties' button. In the next dialogue box, you enter the IP address you want to change the computer's IP address to and then click on 'OK'. After a few seconds (or so), the new IP address will be in place and you can configure the device. When you have given your new device its new IP address so that it is on your LAN, you will have to change the computer's IP address back again just by repeating the process. Unlike a desktop PC, a configured server only needs to communicate with the outside world through its network connection. Like things such as software firewalls and so on, anything that is running that is of no use just gets in the way as far as memory and other resources go; and also, extra processes that are not part of the server or its supporting processes only serve to weaken the security (including reliability) of the server - things such as buffer overruns, resource conflicts which both allow malicious users to gain a foothold and genuine user's experiences being degraded. A firewall - just a basic one if you have another dedicated firewall as all you need to do is to make sure that anything that has broken through the outer layer of perimeter security has yet another obstacle in its way. You certainly don't need to run a GUI. It is possible to set up a server completely without using a GUI but today, a GUI makes things so much easier. However, once you have your server configured, you need to shed the GUI as it becomes nothing more than a parasite - stealing your resources and giving nothing in return. So how can this be done with Windows? Unfortunately, the GUI is designed to be a part of Windows so the Windows Operating System is not suitable. as 'root' at the command prompt - in this case to start run level 5. So, to set up your server, you boot up into Runlevel 5 and once you have everything running the way you want it - so that everything runs on boot up - you go and set the default Runlevel to 3. 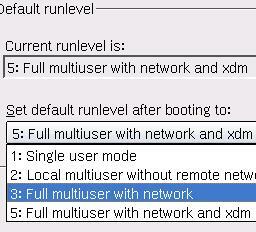 This can be done in SuSE Linux using the Runlevel editor. 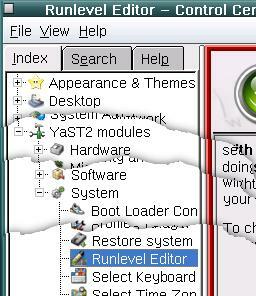 edit the configuration files, install drives or whatever you need to do and then reboot into run level 3. USB cameras are limited in so far as they have to be within 5 metres of a computer which in effect ties up a computer. In addition to this, computers consume quite a bit of power so if you are thinking about having one with a UPS, it will not be able to keep taking images for such a long time. With an IP camera, they only take around 15 Watts so a UPS that would give life to a medium-sized computer for 15 minutes will last considerably longer. In addition to this, you are not tying up a computer and, you can have the IP camera up to 100 metres from any other piece of hardware such as a switch although you do need a mains supply nearby (some of the more expensive ones can have power over Ethernet which means that your power supply can be as far away as the other end of the Ethernet cable ie, up to 100 metres). Clearly IP cameras have a definite advantage but another thing to consider is that some IP cameras can be Wireless. With regard to wireless, I would avoid it if you are using the cameras for security work as wireless generally is far more vulnerable to attack. So, if you have a local web page that reloads itself every few seconds or so (depending upon how much network capacity you can afford) then, each time it loads, it will load a new image from the camera. You can, of course, use these cameras for anything you like so, if you look at the image on the right, you can see that it is possible to work and keep an eye on the Guinea Pigs in their pen on the front lawn at the same time. If you want to cut down on the web page content or have a number of them on the same page, you can put them in iframes so that each reloading page has its own little bit of the browser window. As far as logging into a number of cameras at the same time is concerned, (most) browsers (certainly all of them that display images that I have come across) will maintain many current realm/userid/password combinations so that you don't have to log in repeatedly. 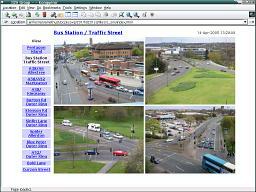 Although this is not a real IP camera web page, it does demonstrate some of the potential of the system. Click on the image on the right to load it in another browser window. The difference is that instead of having four cameras with different IP addresses - of which each needs logging into the first time - we have a common directory with a series of images in it that represent four cameras. Each of these images is called by a self-loading page that sits within an iframe in the main page. It is fairly easy to modify this so that each image page loads itself so that a fresh image is loaded and also, instead of waiting 10 seconds (as in this example) to put a self-referencing link on each image so that if you click on the image, it refreshes instantly (in this example, it just loads the next one in the sequence). In the real situation, you could have a set of these pages as indicated by the mock menu down the left hand side of the example page.